I just uploaded 3 days ago, Japchae video recipe! Finally I’m writing down the written recipe of Japchae so you all can go grocery and make this easy delicious Korean noodles!!! Check my video recipe first!! Combine beef and next 5 ingredients for beef in a medium mixing bowl. Toss and coat evenly; let stand at least 10 minutes. Heat a medium nonstick skillet over medium-high heat. add 1 teaspoon oil; swirl to coat. Add beaten eggs swirl skillet to egg covers surface in a thin layer. Cook until it's just set, about 1 minute, then flip over and cook for another minute. Slip omelet onto a plate and let it cool. Heat a large skillet over medium-high heat. Add 1 teaspoon oil; swirl to coat. Add onion and a pinch of salt to pan; sauté 5 minutes. Remove onion from pan, keep warm. Add 1 teaspoon oil to pan; swirl to coat. Add chili pepper and a pinch of salt to pan; sauté 1 minute. Remove chili pepper from pan, keep warm. Add 1 teaspoon oil to pan; swirl to coat. Add 1 teaspoon oil to pan; swirl to coat. Add carrots and a pinch of salt to pan; sauté 3 minutes. Remove carrot from pan, keep warm. Add 1 teaspoon oil; swirl to coat. Add mushrooms and a pinch of salt* to pan; sauté 2 minutes. Remove from pan, keep warm. Add 1 teaspoon oil; swirl to coat. Add marinated beef to pan; sauté 7 minutes or until cooked through and all moisture has evaporated. Remove from pan, keep warm. Bring a large sauce pan of salted water to a boil. Add spinach, cook about 10 seconds, no much longer. Move spinach from the boiling water to ice water immediately. Squeeze out water from spinach as much as you can. Combine squeezed spinach with garlic and next 4 ingredients in a mixing bowl, mix it with you hand. Set aside. In same water blenched spinach, add Korean sweet potato noodles and 1 Tablespoon oil. Boil noodles according to package directions or 6 to 10 minutes. Drain and set aside. whisk all ingredients for sauce (From soy to black pepper) in a small bowl, set aside. Slice cooled egg omelet into thin ribbons and set aside. Cut the noodles as needed. In a large mixing bowl or a large plate add noodles and pour sauce. gently mix it until noodles absolve sauce; add stir-fried vegetables and beef, toss gently to combine. 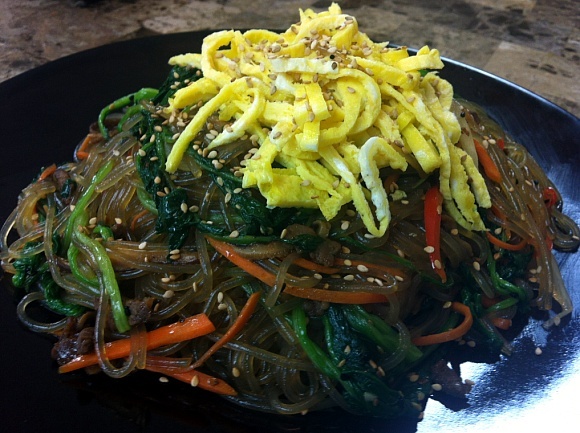 Garnish Japchae with reserved egg ribbons and more sesame seeds as desired. This was so awesome! And easy!! My family loved it! Thank you! Hello. Your save and print functions are not working for three recipes that I have tried. So I’m guessing it may be an error to anywhere in your site. Thank you. That’s weird… because it works on my computer..? When you click the “print” button, it opens as a pop-up window or a new tap on your browser to print. So please check out your internet browser(window, chrome or whatever you’re using) option if you blocked the pop-up window option. Unblock it and try again! Yes. It open up a new tab. However, what’s showing on that page is gibberish… mostly picture codes, not letters and words. I have tried on both desktop and iPad. I see, thank you for letting me know. Give me some time to handle the issue!